Hearing impaired mobile device users now can hear audio directly from the Apple iPhone, iPad or iPod touch thanks to a new Sound Processor that will soon be offered by Cochlear Ltd. The Nucleus 7, available in the U.S. this September, will be able to stream the audio from an iOS device directly to the microchips in the company's hearing implants without requiring another device to act as an intermediary. Currently, those with a cochlear implant have to use a Bluetooth device with the sound processor and the phone in order to allow the audio to run through the implants. While the Bluetooth device would usually be worn around the neck like a pendant, the new technology means that this will no longer be necessary. The company's sound processors turn sound from the environment into electrical signals, which are transmitted to an implanted electrode that sits in the inner ears of those who are hard of hearing. Because the processor sits outside the ear, it can be updated to carry the new feature without requiring a new implant. Users will be able to customize the sounds they hear by using the free Nucleus Smart App from the App Store. In addition, a feature on the app will allow users to find a lost Nucleus 7 processor. The Nucleus 7 sound processor will be available as an update in October for the following Cochlear implanted devices: Nucleus CI24RE, CI500 and Profile Series Implants. What about Android phone users? I'm happy for PA reporting this because I use cochlear implants. The Nucleus 7 Sound Processor is an apple processor and they lincense it free of charge. Apple is always great at health stuff Hear is a direct quote from Cochlear Limited "Nucleus 7 Sound Processor is the world’s first Made for iPhone cochlear implant sound processor and the smallest and lightest behind-the-ear cochlear implant sound processor available on the market […] “The approval of the Nucleus 7 Sound Processor is a turning point for people with hearing loss, opening the door for them to make phone calls, listen to music in high-quality stereo sound, watch videos and have FaceTime® calls streamed directly to their cochlear implant,” explains Cochlear CEO Chris Smith." 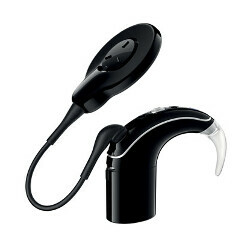 Reuters "Apple has also worked with hearing aide firms such as GN ReSound and Starkey, which can also connect directly to the iPhone. Apple developed the protocols with the firms and licenses it to them for free." Sarah Herrlinger, director of global accessibility policy for Apple, said a key challenge with implants was fact that audiologists do not always prescribe a matched set of Cochlear implants. Often doctors recommend one implant and one hearing aide, often from a different maker. “We had to figure out how you could do a bi-modal solution where you’re able to simultaneously pair, control and hear both of them running at the same time,” she said. “That was a really interesting engineering opportunity for us to solve.” It is covered under Made For Iphone so it won't be available for android. Ya I was wrong about it being for made by apple. But the protocols used for the Iphones will be Apples, the Android version won't have the same ease to use because it will use different protocals. URL for this article looks funny.. I just noticed it...oh my god.